﻿ Hilton Orlando Bonnet Creek Resort, Orlando (FL) | FROM $144 - SAVE ON AGODA! Have a question for Hilton Orlando Bonnet Creek Resort? "The restort is magnificent, with beautiful pool and golf view." "I highly recommend this resort for an enjoyable stay in Orlando." "It made our time at Disney greatly enjoyable." "Service was excellent, we got upgraded thanks to our HHonors..."
Located adjacent to Walt Disney World Resort, Hilton Orlando Bonnet Creek Resort is an ideal spot from which to discover Orlando (FL). Nestled on a 482-acre nature preserve, guests are well located to enjoy the cities world famous attractions and activities. A 3-acre lazy river is on site and features a water slide, fire pits and private cabanas. The hotel is an 8-minute drive from Epcot, home of the Epcot International Food & Wine Festival. The facilities and services provided by Hilton Orlando Bonnet Creek Resort ensure a pleasant stay for guests. The hotel offers numerous on-site facilities including free shuttle service to and from Disney Theme parks and a poolside bar. 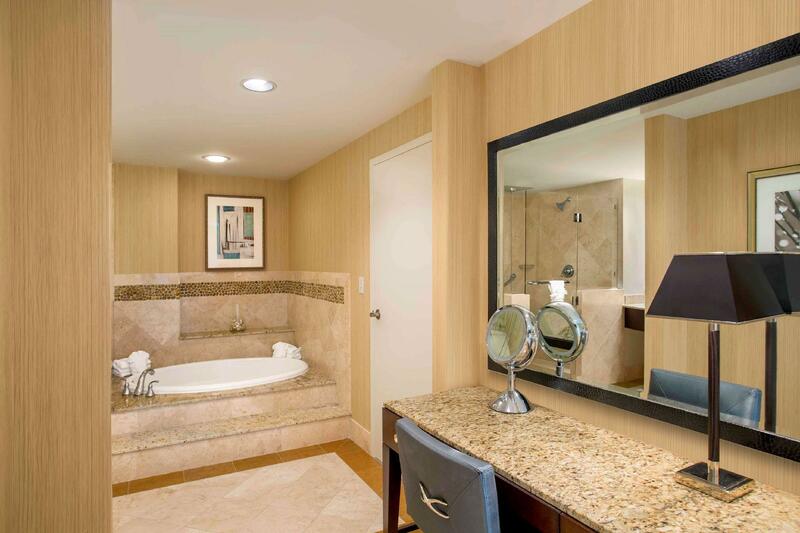 Guests can also appreciate in-room amenities such as Crabtree & Evelyn toiletries, in-room coffee maker, and a refrigerator. A 55-inch flat-screen TV comes standard in each room at the hotel along with an MP3 docking station. A laptop safe is provided as well. With 12 onsite restaurants and bars, Hilton Orlando Bonnet Creek Resort has numerous dining experiences from fine dining to casual to grab-and-go options. The hotel’s signature restaurant, La Luce, serves Italian cuisine for dinner. Room Service is also available 24 hours. Kids can enjoy the supervised children’s club and the hotel includes an onsite Disney store, which offers official Walt Disney World merchandise and tickets to Disney Theme parks. Guests can also enjoy the facilities offered at the adjacent Waldorf Astoria Hotel which includes an 18 – hole golf course and the Waldorf Astoria Spa. With an ideal location and facilities to match, Hilton Orlando Bonnet Creek Resort hits the spot in many ways. "The staff at Harvest Bistro (Kurt and Jessica including othe..."
We just returned from spending a week at Hilton Bonet Creek. We are glad that we choose this resort. It made our time at Disney greatly enjoyable. It is close to all Disney theme parks and have regular free shuttle service. We used Uber or Lyft at times and it's no more than $10 one way. There's hardly anything to fault at this resort. It's new, clean and have great facilities. The staff is welcoming and ready to help. The staff at Harvest Bistro (Kurt and Jessica including others) are the stars of resort and will endeavor to make your stay memorable. I highly recommend this resort for an enjoyable stay in Orlando. We stayed there for a vacation to be near the themed park. Service was excellent, we got upgraded thanks to our HHonors card with complimentary parking and breakfast. The restort is magnificent, with beautiful pool and golf view. Ideally located to Disney and Universal (15 min drive) we enjoyed a luxurious place to kick back after a long day having fun. Was on my honey moon and had the do-not-disturb sign up and the kitchen staff knocked 3 times in the morning. Did I mention it was my HONEYMOON!!!!!!!!!!!!!!!!!!!!!!!!!!!!!!!!!!!!!!!!!!!!!!!!!!!!!!!!!!!!!!!!!!!!!!!!!!!!!!!!! they have big pool, it was very nice for children. The hotel was in a very prime location where other Disney hotels were around. There was a free shuttle service to Disneyland which was very convenient and was never late and the 24 hour shop. My flight arrived in Orlando at 6am and I requested the night before for early check-in they granted this and gave exceptional service. The staff were very friendly and the service was quick. We had dinner in the Japanese restaurant, the food was good, hotel pricing though and portions were quite small. As for the facilities, the gym was well equipped and the pool was very nice to lounge around in. I stayed at this hotel for a conference. The restaurants were reasonably priced and the Italian restaurant in particular was fantastic. There were too many families and children during the conference stay so it was a long wait for lobby service. The pool area is spacious and there is a well equipped fitness centre. The wifi was fairly stable, but not fast enough for Skype. Rooms were clean, but air was stale and heavy. The seal on the shower door was falling off and water continually pooled on the floor. I stayed here a few days before a business trip. The staff are friendly and offer quick service. The rooms were clean, but the air was stale and heavy. Sometimes had difficulty breathing. The seal was broken around the shower and water pooled in large puddles on the floor. Internet was stable, but too slow to Skype. Could not have asked for more! Excellent, and loved that their sister hotel, the Waldorf Astoria, was within walking distance (Or golf cart shuttles were readily available), to enjoy their amenities. We had lunch there one day and was able to charge it to our room at the Hilton. The only negative is that there was a conference being held there the same days of our stay, and the NOISE level in the lobby (which was very expansive) was deafening. It felt very stressful even walking through there. If you're coming for a restful and peaceful respite, I would call ahead to book when there is not a conference being held. This hotel is true to the Hilton brand. Its beautiful, spacious, clean, friendly service and great location. Everything was great. Checking in/out process was quick and easy. The staffs at the front desks were friendly and informative. We had dinner at the Italian restaurant at the hotel. The food and service were great although things were a little pricy. Shuttles to attractions were free and on time. The hotel is very close to the Disneyland, which is quite convenient to get there. The hotel also provides shuttle service to every theme park which quite facilitates the way you get there. The whole environment was great as well, where there is a swimming pool and some fine restaurants.We eat in the hotel everyday, it was a little bit expensive, which is quite understandable. Overal, the hotel was great! the hotel was extremely great. it was actually a resort, which includes swimming pools, a couple of fine restaurants, and some bar/grills. it was very nice to spend your holiday with hilton bonnet creek. they also provide shuttle service go back and forth between the resort and the disneyland. there are also taxis in front of the gate of resorts, which you can take them to universal studios or airport, and it is always the flat rate, which are reasonable. also, there is an outlet nearby the downtown disney, which is close to the resort as well. very good location overally.